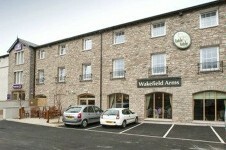 ​New Premier Inn situated in the beautiful Lakeland market town of Kendal. Great location for exploring the Lake District with Windermere just 9 miles north. This Premier Inn is close to the railway station with connections to the West coast main line. Kendal is a lovely historic town full of quaint restaurants, a theatre complex and superb shopping outlets. The Premier Inn Kendal has a great Table Table restaurant, air conditioned rooms and WiFi available throughout the building. Book direct to get the best Premier Inn Kendal deals.